If you never got the chance to build one as a kid [JoOngle] takes you through the steps to build your own radio receiver. Details are a bit scarce but it’s nothing your friend Google can’t help you out with. If your Blackberry trackball stops working well you can try this non-technical fix. Remember when mice used to have a ball in them and you would need to clean out the gunk from time to time? Forcefully skidding your Blackberry across a piece of paper does a similar service. Open source can be a great help to small businesses. Here’s a way to use a Linux machine to make time-lapse movies from surveillance camera feeds. We especially enjoy the use of a desktop wallpaper that has the terminal commands necessary to start recording. Here’s a way to host a simple webpage using Dropbox. It’s one of those easy ideas that you wouldn’t come up with yourself. When you place an HTML file in your Dropbox you can get a public URL which will be built as a webpage when visited with a browser. To round out the weekend here’s [Osgeld’s] tips on inline wire splicing. We laughed as he recounted spearing himself with stray strands. This is pretty simple stuff but he’s explained it well and who’s to pass up a good tip? Add a bit of interest to your radio equipment with one of these unorthodox CW keys. [OH6DC] has been hard at work posting almost sixty of these hacks. Above you can see an alarm clock whose snooze button acts as the key, and a nail clipper used as a key. There’s a banana , a cross-country ski shoe , and a toaster key. The rest you’ll have to see for yourself. Any of these would work perfectly with that Morse code keyboard you’ve been wanting to build. [Okie] designed this audio effect shield for Maple. You’ll remember that Maple is a prototyping system built around an ARM processor, so there’s plenty of power and speed under the hood. First and foremost, the shield provides input and output filters to keep noise out of the system. 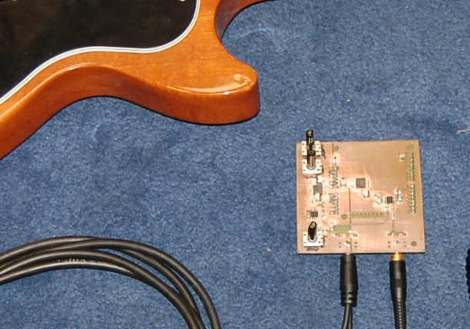 From there a set of potentiometers let you change the effect, with the manipulation like echo, distortion, and ring modulation happening in the firmware. We’ve got a couple of very high-tech shoe boxes in which we store our prototyping accessories. You’ll find a collection of LCD modules, chips on breakout boards, switches soldered to homemade boards for easy breadboarding, and much more. That is assuming you can find anything in that mess of components. [Shahriar] took a different approach. 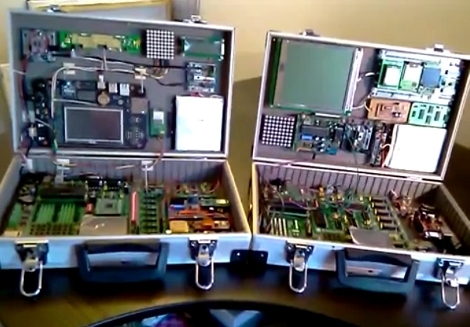 He’s mounted all of his prototyping gear inside of a briefcase. This large collection of high-end boards include PIC prototyping, various LCD screens, and a large portion of SparkFun’s stocked boards. It’s much more advanced than the Arduino to-go platform, and you can see a full walk through of the system after the break.